Wood is arguably the most common and popular type of fencing used around homes throughout the country – and it’s been this way for the better part of four centuries. There are plenty of other materials to choose from – many of which are excellent in their own right, but homeowners seem to turn to wood fencing in particular over and over again. In fact, back in 2007, American homeowners installed around 59,000 miles of wood fencing, which is enough wood fencing to circle the earth two times over. Almost ten years later, wood fencing continues to be in just as high demand. Why is Wood Fencing so Popular? Wood fencing is inexpensive – It costs a significantly less to invest in wood fencing than it does to use other materials, such as stone, brick, steel or iron. Wood fencing will improve curb appeal – Although cheaper than other materials, wood fencing can still look extremely beautiful and can complement the look of your property. Wood has a traditional beauty that few other materials can match, and it certainly looks better than materials that are cheaper than wood, such as chain link fences. Wood fencing is flexible – The biggest advantage of using wood for your property’s fencing is that it is an extremely flexible material. It can be shaped to give your property a unique look. There are dozens of different styles that you can choose from – and they can be painted various colors too. Although other materials may have their own advantages, this is typically not one of them. There’s only so much that you can do with steel or stone in terms of the fence’s aesthetic. What Types of Wood Should Be Used? White Oak – White oak is extremely durable and tends to remain so even when exposed to harsher elements, such as rain, snow, and the wind. Black Locust – Black locust is another wood species known for its durability. In fact, black locust wood fences have been known to last for decades without the need for maintenance. Western Red Cedar – Western red cedar is naturally resistant to insect infestations, rot, and moisture – all things that often cause problems with lesser quality wood. Tropical Hardwoods – Tropical hardwoods, which include Brazilian Cherry and Tigerwood, are considered exotic and therefore tend to be on the most expensive end of the spectrum. However, they are incredibly hard and dense, which means that your fence will not only have a unique beauty but will be built to last. Pine – Pine is typically one of the more affordable wood species to use for your fencing. However, pine fencing can be more vulnerable when it comes to insect infestations along with moisture and rot issues, which means it requires more maintenance. You can have the pine wood pressure treated to make it more resistant to such problems, but this is more expensive and does require the use of chemicals. What Types of Wood Fences Are There? 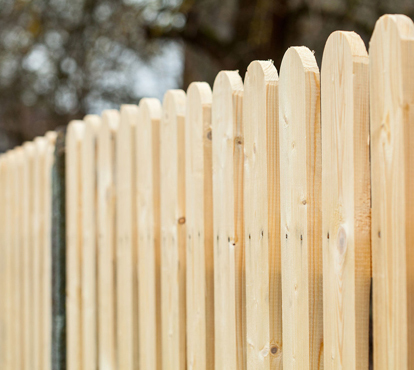 Picket Fences – Picket fences are better suited for improving curb appeal and defining the boundary around your property. They can also keep children and animals out of your yard. Vertical Boards – For a fence that can do a more effective job securing your property as well as helping block out the wind and noise, vertical boards are a good option. The smaller the gap between boards, the more privacy you’ll have. Lattice Fences – Lattice fences are great if you want to privacy and security but want to allow sunlight and the wind to come through. This makes lattice fences a good option for gardens. Louver Fences – Louver fences use staggered boards so that they provide privacy when viewed straight on, but allow you to see outside your property from an angle. This means that airflow and sunlight can still get through and you can still enjoy a view but will still retain some privacy while providing security as well. Louver fences are a good fit for pool areas, decks, and patios. Dog Eared Fences – If you want complete privacy and security, dog eared fences are a good choice. They make use of vertical boards without any gap between them, thereby creating a solid wall. Dog eared fences are a popular option for properties where the land is uneven since you can modify the fence sections to fit your property without breaking the flow or uniform look of the fence. Wood fencing remains one of the most popular fencing choices for good reason. As you can see, there are a lot of options to consider, which makes it easier to find a wood fence that fits your particular wants and needs.